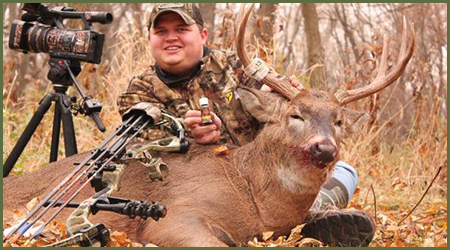 Timber Valley Fresh Scent in Petersburg, Illinois, makes potent buck lure products for recreational deer hunting. We've gone to great lengths to develop our deer urine items to exceed the expectations of hunters nationwide. Our products are immediately refrigerated at 35 degrees after harvesting and during shipping to maintain freshness. Unlike other scent companies, you can return your bottle for a full refund if you're not completely satisfied with the results. Hunters ask for our Fresh Doe Urine, Dominant Buck Urine, and 4-Play products by name because customers receive outstanding results every time with our deer scents. Whether you prefer bow hunting or using a rifle or a shotgun, you'll be impressed with the big game our items attract. Every homemade deer scent we produce is made from 100% fresh deer urine. Our popular Timber Valley Fresh Scent Volumizer helps to amplify the range of a scent, whereas our Trophy Sampler Pack is a cost-effective way to try out many of our hunting products. deer in your area with our fresh products.